unit traveling from Germany To Narvik in Norway via Sweden. 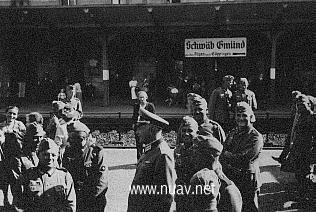 A cheerful crowd of soldiers is ready for their long journey to Narvik. The unit traveled by train to the northern coast of Germany, then mounted a boat. This boat brought the unit to Sweden. 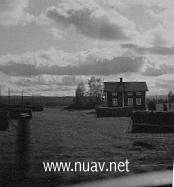 In this picture, you can see a swedish house as seen from the window on the train that was on it's way to Narvik! A very rare picture! A gebirgsjaeger officer at the left and a Swedish soldier at the right! The Swedish soldier does not seem to be happy about the situation. 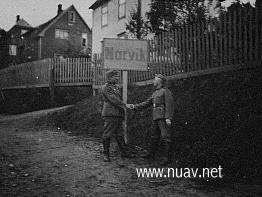 Handshake in Narvik! 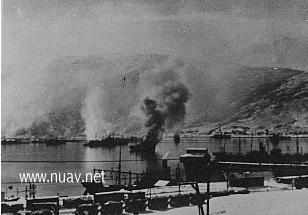 These soldiers was happy to finally reach Narvik! Little did they know about their long journey that was to come some years later. This unit would later be transferred to Finland and Russia, where they in '44-45 had to flee the same route back to Germany, this time through Norway, though. Narviks harbor, filled with burning wrecks. It was truly a war zone this unit entered! 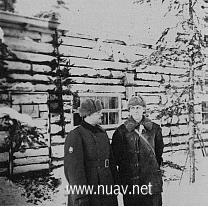 All pictures/material unless otherwise stated, are owned or supervised by NDWW2/NUAV's webmaster. You are not allowed to copy, publish or in any way distribute material from these pages without the webmaster’s written permission.This site do not represent any kind of political statement, it is made by people with the historical interest of Norway in the period between 1940 - 1945. Copyright 1999, 2000 © Kurt Monsen.